City of Gosnells engineering construction co-ordinator Darren Smith and Mayor Glenn Dewhurst look over plans for Spencer Road. ONE of the City of Gosnells’ oldest and busiest roads is getting a $4 million makeover to improve safety and ease congestion. Drainage and preliminary works on Spencer Road in Thornlie have begun as part of an improvement project to enhance the 1km section between Yale Road and Thornlie Avenue. Construction will be completed in three stages over 18 months from now until mid-2019. The project is expected to result in improved drainage to prevent flooding, as well as new lighting and streetscaping. The natural screening between Spencer Road and the service road on the northern side will be replaced towards the end of the project as the plants have reached the end of their life. 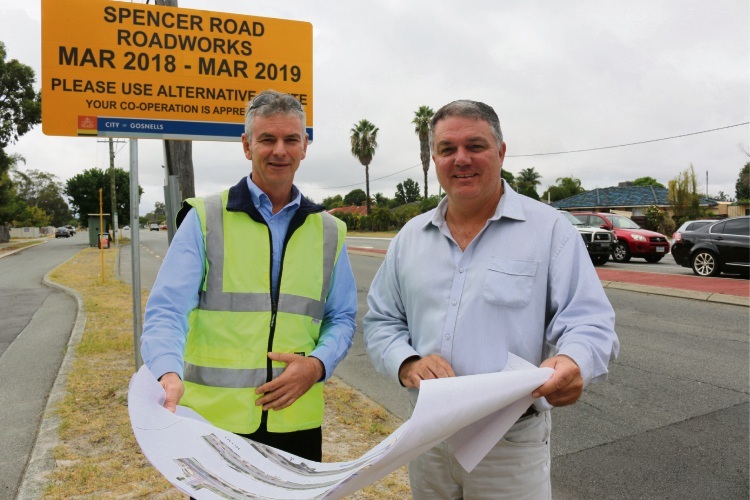 Gosnells Mayor Glenn Dewhurst said it would significantly improve conditions for the 20,500 vehicles a day currently using Spencer Road. “Among the most important upgrades will be the installation of a median to divide the dual carriageway and create turn-off lanes, making it safer for motorists travelling in both directions,” he said. “Spencer Road is unique as it has many intersections and parallel service roads, so the modifications have been designed to make left and right turns safer to and from Spencer Road, as well as provide U-turns where needed. The City of Gosnells is contributing one third of the overall cost, with two-thirds funded by the State Government’s metropolitan regional road group.